Have fun manipulating facial profiles using our many “Face” stickers. Ever wanted to know what you look like with a beard? Maybe you want to check out how you look in a pair of glasses? How about a funky hairdo? This guide shows you how to add facial features to any profile photo using our Face stickers and to top it off, the “Greyscale” filter. 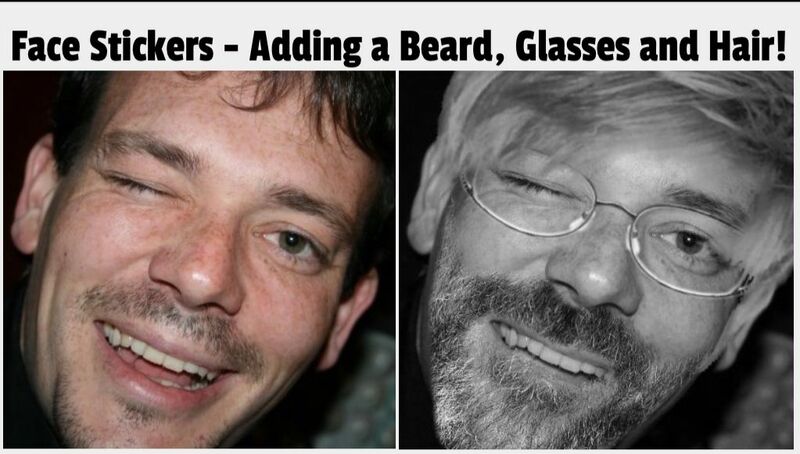 We upload a profile photo, add a beard, glasses and hair and download both the colour and greyscale version of our creation. First we upload a profile photo and select the “Stickers” section followed by “Face” in the dropdown menu. As you can see, there are lots of stickers, choose a beard, some are cartoon like, some are realistic. Use the rotate button at the top of the image to get the beard to the perfect angle of the face. Drag the beard to fit the face as best as you can. Next we find a pair of glasses that we want to use, drag and resize to fit. We put the glasses on before the hair so that the hair overlays the glasses. You can also move layers from front to back and vice-versa. Find a hair style and drag and resize to fit the face. When it looks as realistic as possible, click “Save” to download the colour version. Use the “Greyscale” filter to create a black and white version of your creation for maximum realism.